Some time after the Torahs were buried, this stone was erected to mark the site. 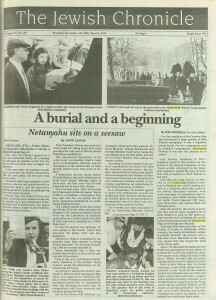 The newspaper articles after the photograph cover the burial ceremony and subsequent setting of the stone. On Sunday, Dec. 15, Congregation Beth Shalom will hold the memorial program, “Reflection, Rebirth and Renewal,” during which they will bury the remaining fragments of the Homestead Shul Torahs which were destroyed in October’s fire. 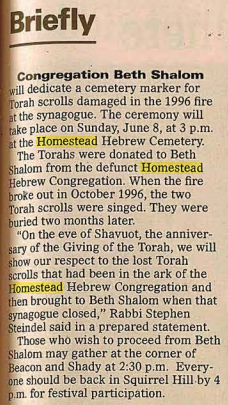 “This is our respectful Jewish burial tradition for the very tiny remains of the two Homestead Torahs” said Rabbi Stephen E. Steindel. “We are burying them in the sanctified cemetery grounds of Homestead Hebrew because they suffered the greatest loss. This is a way to offer the community a sense of closure,” he explained. The memorial program begins at 9:30 a.m. in the JEI/CDS all purpose room, followed by a procession to the Homestead Hebrew Cemetery at 10. The burial service will take place at 10:45, and the procession will return to Beth Shalom at 11:30. Upon returning to Beth Shalom, they will “introduce the concept of the Torah which will be written to replace the teen’s Torah,” Rabbi Steindel said. The Homestead Shul Torah was used by teens during the weekly USY services. “Now we hope to step forward in a sense of reflection, rebirth and renewal,” he concluded. For further information or to reserve a spot on one of the busses, call the synagogue at 421-2288. The remnants of two sacred Torah scrolls that were heavily damaged in an October fire in Beth Shalom Synagogue were buried yesterday during a somber ceremony in a Jewish cemetery. 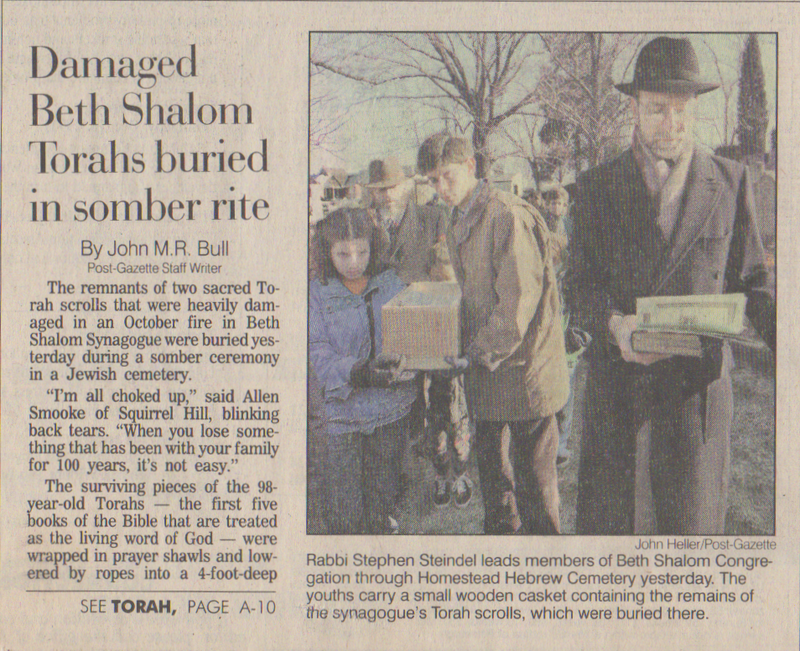 The surviving pieces of the 98-year-old Torahs — the first five books of the Bible that are treated as the living word of God — were wrapped in prayer shawls and lowered by ropes into a 4-foot-deep grave at the small, secluded Homestead Hebrew Cemetery in West Mifflin. More than 200 members of the Squirrel Hill congregation recited Scripture and the Mourner’s Kaddish — the traditional prayer for the dead. Then each person dropped a handful of dirt on the small casket that contained the Torah remnants. The memorial service was something of a challenge to put together. Jewish life in Conservative congregations is influenced by tradition. But no Torah in this area in memory has required burial, so the traditions were unknown. In fact, only one member of the congregation had ever seen such a burial service. And he couldn’t recall any details because it occurred when he was a small boy in Warsaw, Steindel said. So theologians in New York were consulted. Steindel was told to just follow the basic tenets of all Jewish burial services and improvise as desired because there is no prescribed protocols for a Tora burial. So that’s what he did, varying burial customs by having youngsters act as pallbearers and reading Biblical verses that pertained to Torahs. 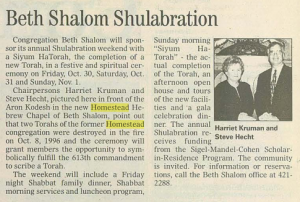 The scrolls had been owned by the now-defunct Rodef Shalom Congregation of Homestead, but were given to Beth Shalom’s 1,200-family congregation when the Homestead synagogue closed in 1988. The Torahs were all but destroyed in the million-dollar fire Oct. 8 that heavily damaged Beth Shalom’s sanctuary, community center and administrative offices at Beacon and Shady Avenue. Congregation members used crowbars to pry open arks and rescue 20 other Torahs from the flames. A new Torah has been commissioned to replace one of the two that were destroyed, officials announced after yesterday’s burial ceremony. A consultant from Dallas will be brought in next month to advise synagogue leaders on how to have a new Torah created. It’s not an easy venture. A scribe must be hired to do the meticulous quill-work needed to craft the scroll. Kosher vegetable ink must be used. The scribe must begin each work day with a ritual bath and recite special prayers while he is writing. One mistake, and the scribe must start all over again. Creating a Torah is also time-consuming, because each contains 304,805 Hebrew characters on 60 sheets of specially treated parchment, said Harriet N. Kruman, a former president of Beth Shalom. The project is expected to talk 12 to 18 months to complete, she said. For the casualties of the October 8 fire that devastated a large portion of Beth Shalom synagogue, it was a dignified, loving burial. 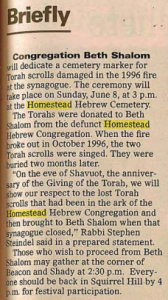 For the congregation and its adopted congregation, Homestead Hebrew, it was also the promise of renewal. Last Sunday, hundreds of Pittsburghers joined in the services for the burial of the charred fragments of two Torah scrolls, destroyed in the blaze that somehow spared the lives of more than 100 youngsters in Beth Shalom at the time. Preceding the long caravan of vehicles to the Homestead Hebrew Cemetery in Munhall was a brief, moving service to a standing room only crowd at the Jewish Education Institute, with brief messages of consolation and remembrance from Rabbi Stephen Steindel, Rabbi Chuck Diamond, USY president Dena Stein, and Andrew Kline and Michael Linden. After the services, the scores of autos and four school buses stopped first at Beth Shalom to pick up the tallis-covered wooden box containing the scrolls before journeying across the Homestaed High level Bridge into Munhall. Although there have been four or five burials of Torahs in Pittsburgh within memory, for nearly all involved, including Rabbi Steindel, the service was a first-time event. Mourners at the cemetery agreed that they hoped the need never arises again. About 150 attended the burial service itself and participated in the mitzva of putting dirt on the tiny casket in a four-foot square hole. Along the way to the grave, Rabbi Steindel and mourners stopped seven times for special prayers. Back at Beth Shalom after the burial ceremony, a new Torah project was announced. A new Torah will be commissioned and an Israeli sofer, or scribe, will begin work on the sacred text, a project that is estimated to last 14 months, as all 304,805 Hebrew characters in the Torah scrolls will be perfectly lettered on 60 sheets of special parchment. Any mistake in the hand lettering with kosher vegetable ink cannot be erased or corrected; the scribe must begin anew. As members of Congregation beth Shalom laid to rest two Torahs Sunday morning, they were comforted by news that a new holy scrollwas in their future. A lengthy caravan of cars, buses and police escorted the damaged scrolls, scarred in the temple’s October blaze, to the Homestead Hebrew Cemetery in West Mifflin. The impressive procession was not unlike those seen during a traditional funeral, for the loss of a Torah is treated with utmost reverence in the Jewish faith. About 75 congregation members braved the morning frost to pay witness to a memorial program that Rabbi Stephen R. Steindel said the area had not seen the likes of in this century. On Oct. 8, a six-alarm blaze erupted in Temple Beth Shalom on Beacon and Shady Avenue in Squirrel Hill. No one was seriously hurt, but two sacred scrolls from the former Homestead Hebrew Congregation were severely damaged in the fire. The Homestead congregation had transplanted its sacred scrolls to the Squirrel Hill temple three years ago when it had shut down. 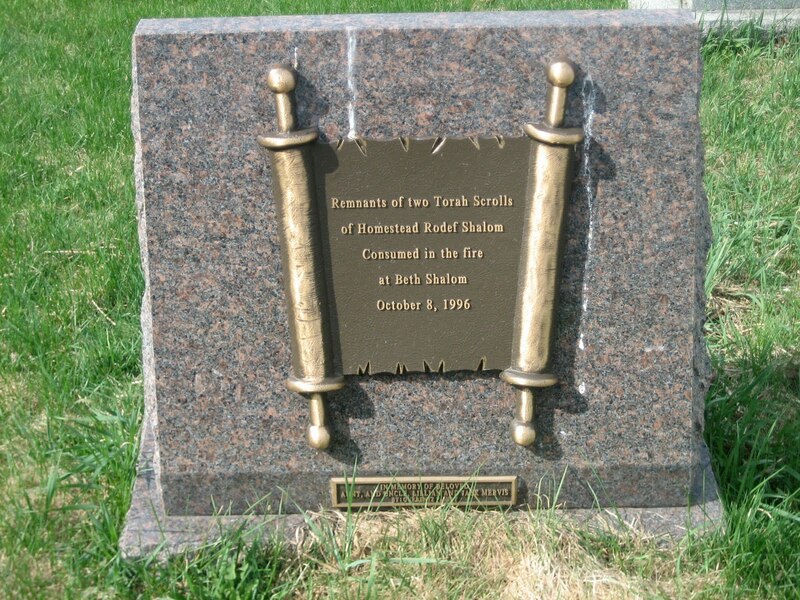 Beth Shalom’s own 21 sacred scrolls were not damaged by the fire. Torahs are meticulous handwritten holy documents transcribed on parchment made from animal skins. They can take well over a year to be completed. Recalling “the awful smoke and flames of Oct. 8,” Steindel led the heartfelt burial service honoring the scroll’s memory while giving thanks the fire caused no loss of life. 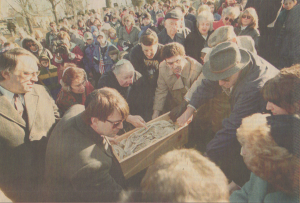 The tiny wooden casket containing the scroll remnants was lowered into a square earthen hole by members of the former Homestead congregation. Younger congregation members joined their elders in the traditional pitching of dirt onto the small casket to complete the somber ceremony. Following the service, former congregation vice president Steven Hecht said the day marked both a rebirth and rededication for the temple. The finished scroll, he added, will will 304,000 caricatures (sic) on 60 specially treated parchments. When the new Torah is completed, Hecht promised congregation members would dance in the streets in celebration. A skilled scribed from Israel will be commissioned to complete the Torah, beginning next year. Steindel said temple members researched past Torah burials to ensure the proper procedures were folloewd. In shaping yesterday’s ceremony, Steindel said he made sure to include the younger members of the congregation, as well those from the former Homestead Hebrew Congregation to forge an unforgettable link between past and present. He said they hope to have Beth Shalom fully operational in time for the High Holidays–by late September, or early October. Congregation Beth Shalom will sponsor its annual Shulabration weekend with a Siyum HaTorah, the completion of a new Torah, in a festive and spiritual ceremony on Friday, Oct. 30, Saturday, Oct. 31 and Sunday, Nov. 1. Congregation Beth Shalom will dedicate a cemetery marker for Torah scrolls damaged in the 1996 fire at the synagogue. The ceremony will take place on Sunday, June 8, at 3 p.m. at the Homestead Hebrew Cemetery. 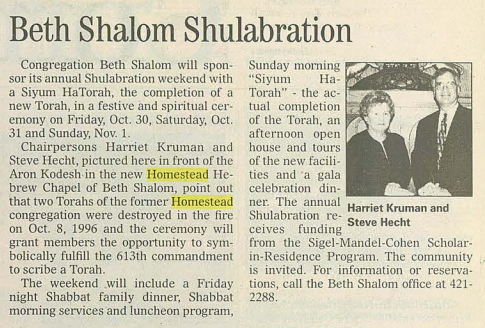 The Torahs were conated to Beth Shalom from the defunct Homestead Hebrew Congregation. When the fire broke out in October 1996, the two Torah scrolls were singed. They were buried two months later. “On the eve of Shavuot, the anniversary of the Giving of the Torah, we will show our respect to the lost Torah scrolls that had been in the ark of the Homestead Hebrew Congregation and then brought to Beth Shalom when that synagogue closed,” Rabbi Stephen Steindel said in a prepared statement. Those who will to proceed from Beth Shalom may gather at the corner of Beacon and Shady at 2:30 p.m. Everyone should be back in Squirrel Hill by 4 p.m. for festival participation.